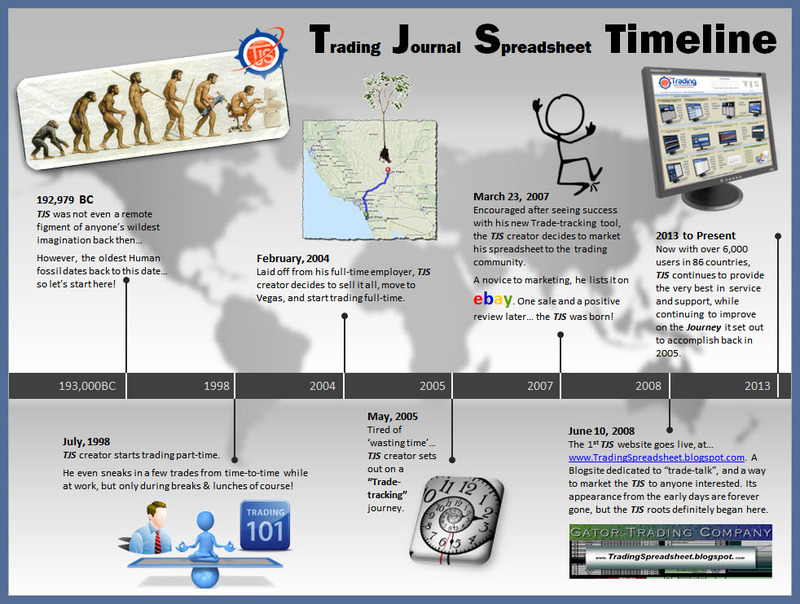 Trading Journal Spreadsheet | Expert Trading Analysis | Get Your "TJS"
Trading Analysis, for Elite Traders! Where Trades Come to Life! For over a decade, the Trading Journal Spreadsheet has been turning raw trading data in to refined (eye-opening) evaluation analysis. Track every move you make in multiple (modifiable) performance tracking categories. Get TJS, and watch your trades come to life. Better trading, through better Analysis! A TJS for ALL Traders! Whether you trade single or multiple markets, the TJS has a version for you: Stocks, Options, Futures, Forex, Spread Betting, or Cryptocurrencies. 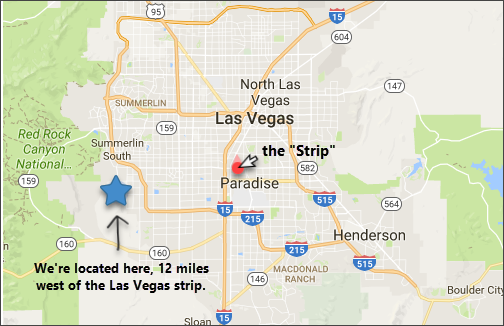 We’ve made every effort possible to ensure your TJS experience exceeds your expectations! Meet Doug and his new Trading Journal. To get the support you deserve from a Trading Journal, it should come straight from the developer. We created the TJS; we stand behind our work and are here to assist you with any questions by email, phone or remote support. We look forward to hearing from you, anytime. Analysis is only half of what we provide! We created tons of amazing features and functionality in each TJS product. Here’s a glimpse of the icon inspired Home Menu, where you’ll find all sheets neatly displayed in an organized format. Many sheets are accessed from the Headers in both Trading Log and Analysis sheets (for quick & easy access), so they’re hidden from view in this image, but can be easily viewed by clicking the “Expand” button while inside the menu. Contact and Support links are included in your TJS Home Menu! Customize & Analyze what’s important to “you”. Expectancy figures for all categories. Know your strength & weaknesses, and compare Strategy performance. Track your mistakes (w/ cost & frequency). Send to Mentor / Instructor function. 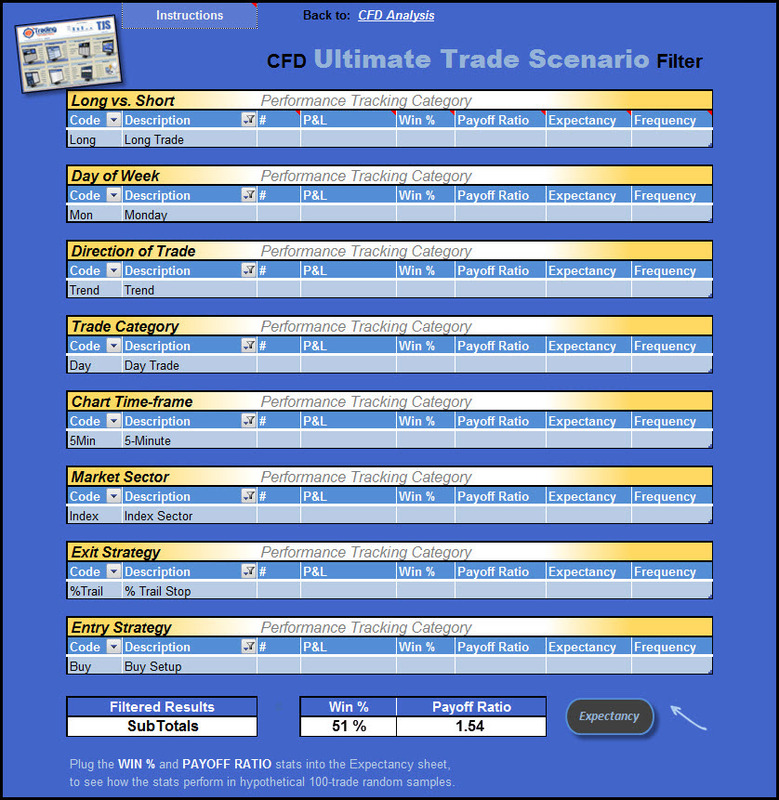 Filter the top producers from each category to find your “Ultimate Trade Scenario“. View all Analysis by: Cumulative, Yearly or Monthly, and by Gross or Net P&L. Fixed header with cumulative results. Trade Review, for each trade. 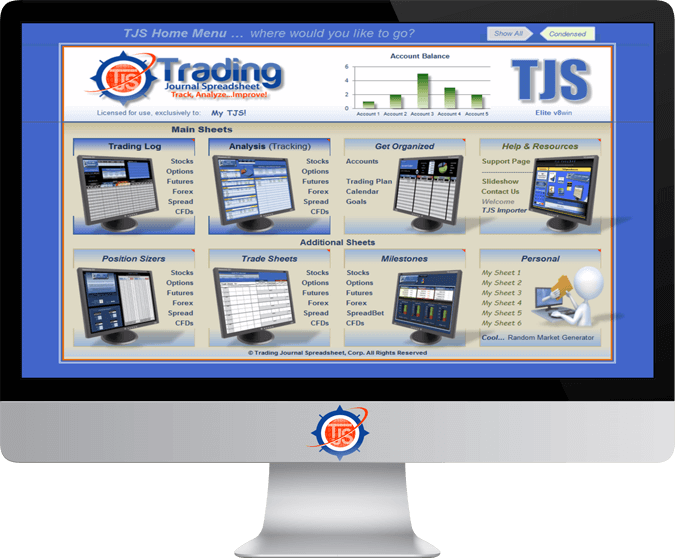 TJS and Microsoft Excel... "Bringing Your Trades to Life!" 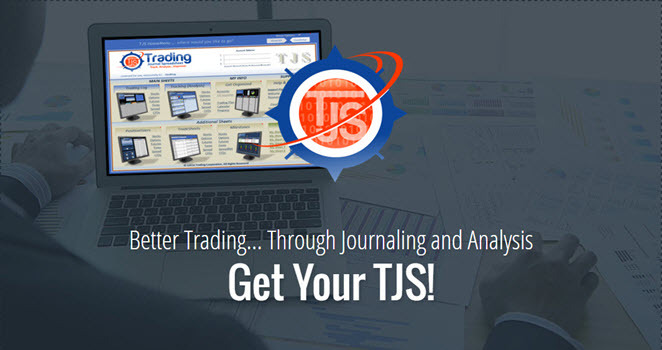 We created the TJS to be user friendly with design features you’ll appreciate, like Text-button links to view various sections of the Trading Log, and Arrow-button links to get you back to where you came from. Just say no to scrollbars! The De-facto standard for spreadsheet software. Excel has the Data Power, Data Visualization, Customization, Advanced Features and Coding capabilities necessary to “Bring Your Trades to Life”. When choosing a Trading Journal, go with a proven platform developer and company that’s been devoted to trade analysis (for over a decade). The current TJS product can be used by all Windows-based and Mac HighSierraOS users. Mac HighSierraOS users will need the latest Excel version (currently Excel 2016 or Office 365). All other Mac users please contact TJS for more info. Traders just can’t stop talking about the Trading Journal Spreadsheet. A few words from some of the happy TJS users around the globe. As someone who has been trading for over 10-years, I have to say that this is the best value for money trading spreadsheet I’ve come across. You have developed the best trade tracking tool and I’m confident that traders looking to increase their performance and forecasting should use TJS. My development to the trading level I’ve achieved is based on three factors: Mentorship, a Trading Plan, and use of the Trading Journal Spreadsheet. The Trading Journal Spreadsheet is the standout tool in trade tracking and analysis. It’s excellent value for money with great customer support. There’s so many great features to your journal, our trading room members are enjoying the benefits where it counts, the bottom line – Profit! This spreadsheet does it all for you. It tracks and analyzes everything you want and need. This is money well spent! 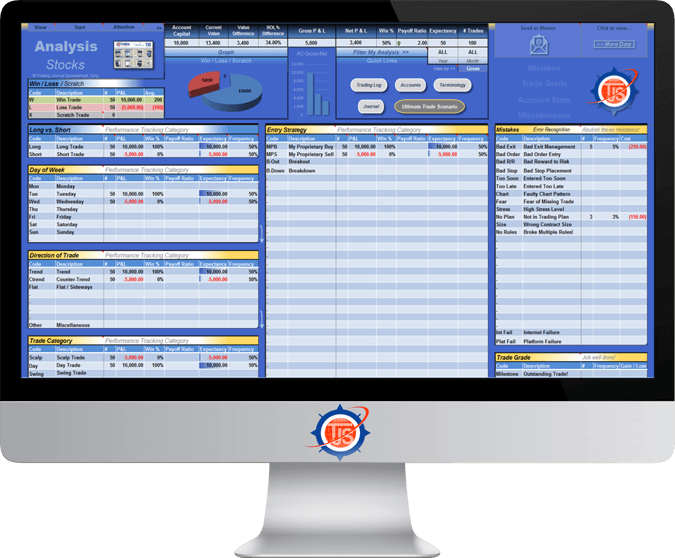 Plan It: Customize the TJS Analysis sheet to “track” what’s most important to you and your trading business. 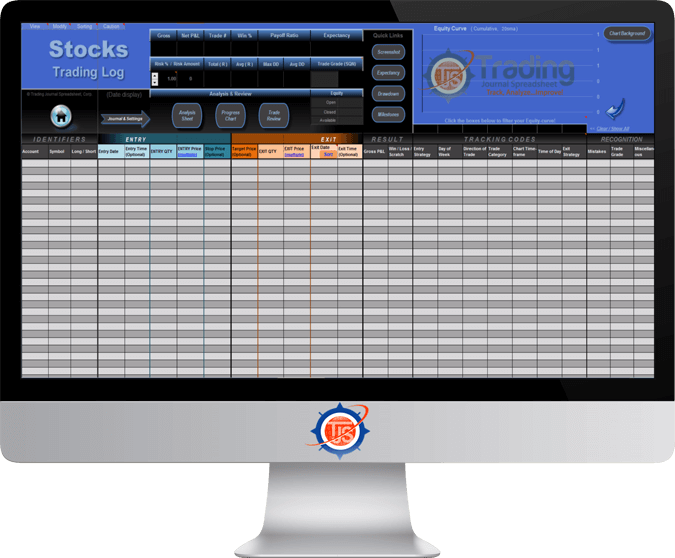 Trade It: While gaining experience in the markets, record everything you do in the TJS Trading Log. Analyze It: The TJS Analysis sheet automatically displays all pertinent stats (at a glance), for your review. Identify Strengths & Weaknesses: The TJS alerts you to which categories are producing either a positive and negative expectancy. Improve: You’ll soon have the knowledge needed to: trade confidently, perfect your plan, increase / decrease risk amounts, progress naturally as a seasoned trader, and become a standout trader. Let's Analyze your trades, shall we? You’ve got questions, and we have answers.